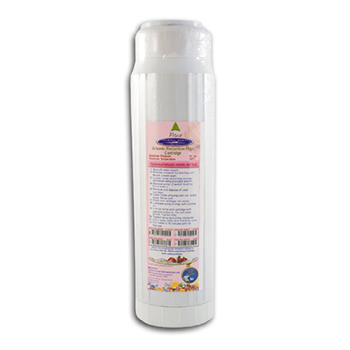 Arsenic Filter Cartridge , a standard 10"x2.5" replacement cartridge that contains an Arsenic-selective media cartridge designed specifically for reducing arsenic III and V. Resin used in the cartridge has a salt form, as clean, moist, tough, uniform, spherical beads. It's performance is virtually unaffected by common anions, such as chlorides, bicarbonates or sulfates. It is effective over the entire pH range of potable water. 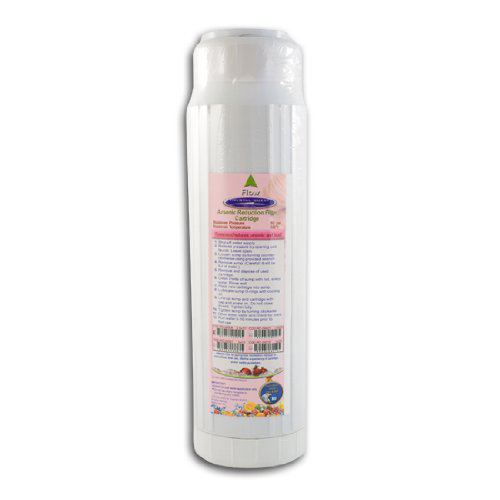 This replacement cartridge works in most standard counter top, under sink and inline filter housings. Arsenic(As) is a semi-metal element that has no taste, odor, or color, and is not easily dissolved. It occurs naturally in the environment, as a by-product of mining, or agricultural areas when materials containing arsenic are used as industrial poisons. It enters drinking water supplies from natural deposits in the earth or from agricultural and industrial practices. It is considered highly toxic and a carcinogen. According to the EPA, people who drink water containing arsenic well in excess of the MCL for many years could experience skin damage or problems with their circulatory system, and may have an increased risk of getting cancer. Increased performance due to more contact time of water with filter media. Cartridge fits in standard counter top, under sink and inline filter housings that use 10"x2.5" (10"x3") cartridges. CQA, Arsenic removal media is a strongly basic hybrid Anion Exchange Resin specifically formulated to selectively remove arsenic. It is supplied in the salt form as clean, moist, tough, uniform spherical beads.